Aveda's new Demi+ hair color line is up to 93% naturally derived and contains a conditioning blend of certified organic plant oils including kukui, sunflower, castor and jojoba - infusing the hair with healthy shine. A green tea extract helps create a broader spectrum of radiant color by acting as a naturally derived color modifier. 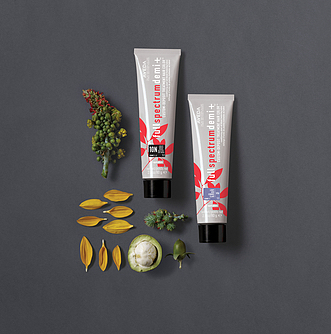 Plant derived L-arginine works as a power booster to increase pH for maximum color deposit into every strand, providing lasting results that fade on tone. Schedule an appointment at any of Tangerine Salon's four Dallas area locations to experience Aveda Demi+.